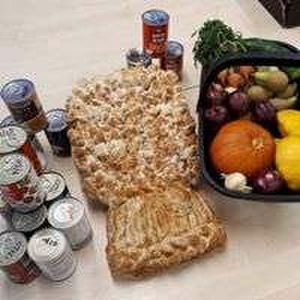 Food Collection point - Why not start up a collection point? If you can co-ordinate we will pick up! 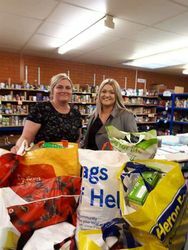 Schools and Colleges play a huge role in supporting the work we do through generous food donations as well as practical help in our Operations Centre through, student placements and work experience days. 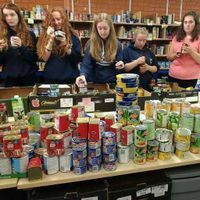 Many schools also give us food and toiletries through giving from special events such as Harvest Festivals and Christmas Appeals. 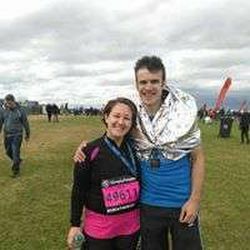 Why not take on your own personal challenge to raise funds for Hospitality & Hope? There's lots of things you could do from more leisurely sponsored walks right through to skydiving and bungee jumping for the more adventurous! We are right on the doorstep of the finish line of world's greatest half-marathon 'The Great North Run' Nominating us as your sponsored charity for the event is easy and gets you fit along the way! Hospitality & Hope was founded by a group of local churches who came together in a practical way to tackle poverty in the local area. To this day we continue to have strong links with churches and other faith groups across the region. Many of our volunteers support us as an outworking of their personal faith and lots of our donations come from coffee mornings, faith festivals and special events. It gives us great encouragement when we hear that churches and faith communities are praying for the work that we do as well as supporting us with their actions too. If you would like more information of would like a representative of Hospitality & Hope to come and give a short talk at your workplace, school or community group, please send us an email using our ‘Get In Touch’ page.